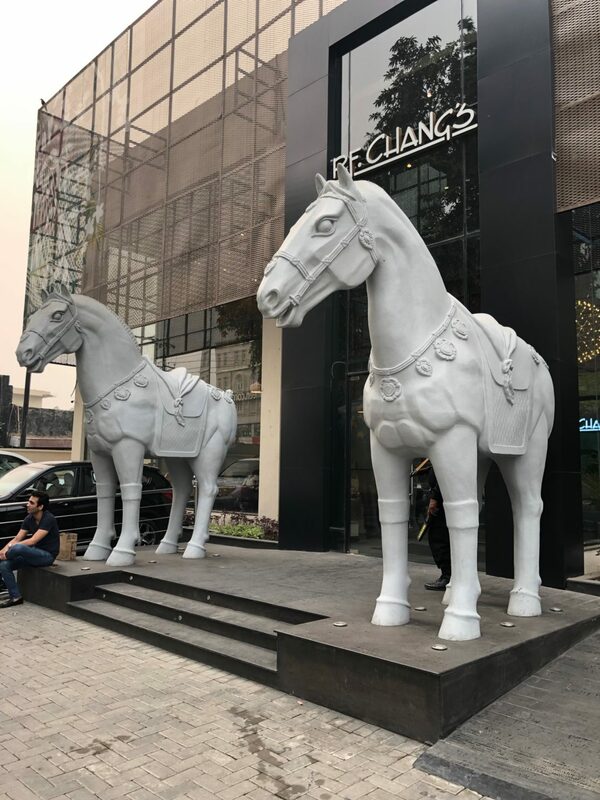 PF Chang’s is a Pan Asian restaurant chain that many Pakistanis are fond of because of the chain having multiple branches in UAE, a place where so much of the population is Pakistani. So naturally, when the restaurant finally opened in Lahore, we went crazy for it. I being one of the Pakistani’s who has been to the Dubai branch countless times decided to go and check it out and see whether it meets my expectations and the international standards in comparison to the Dubai branch. My first attempt at finding a table was unsuccessful thanks to the long line that spread out to MM Alam Road. My second attempt a few days later was successful. For a day (November 1st) when everyone was scared to leave their houses and most of the roads were blocked, I did not expect such a big turnout. Nonetheless, I got a table in a few seconds, something that takes about 20 minutes in Dubai or any restaurant in Lahore for that matter. The huge building and seating capacity can be thanked for that. The décor was perfect but the lighting was a lot brighter than a typical PF Chang’s which has a dark vibe to the environment and the atmosphere of the restaurant was excellent apart from the typical aunties screaming , “Ye PF Chang kya cheez hai,” “ye halal hai ke nai?,” The service was remarkably good and when I say this, I’m comparing it to Dubai, where you can’t get your food in under 30 minutes at least. Despite the place being busy, I was served my order in under 10 minutes. 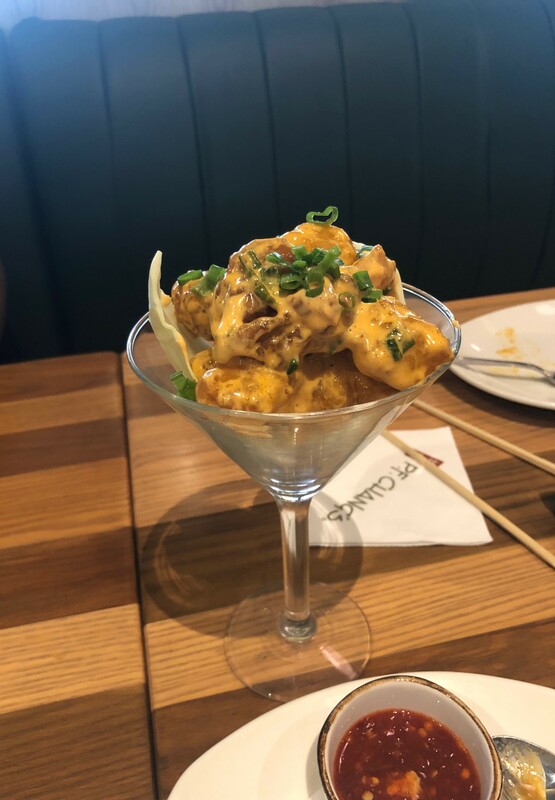 PF Chang’s is famous for two things: the horses installed in the main entrance and the divine Dynamite Shrimp. For starters, I ordered the Chang’s Spicy Chicken Noodle Soup Bowl and Dynamite Shrimp. 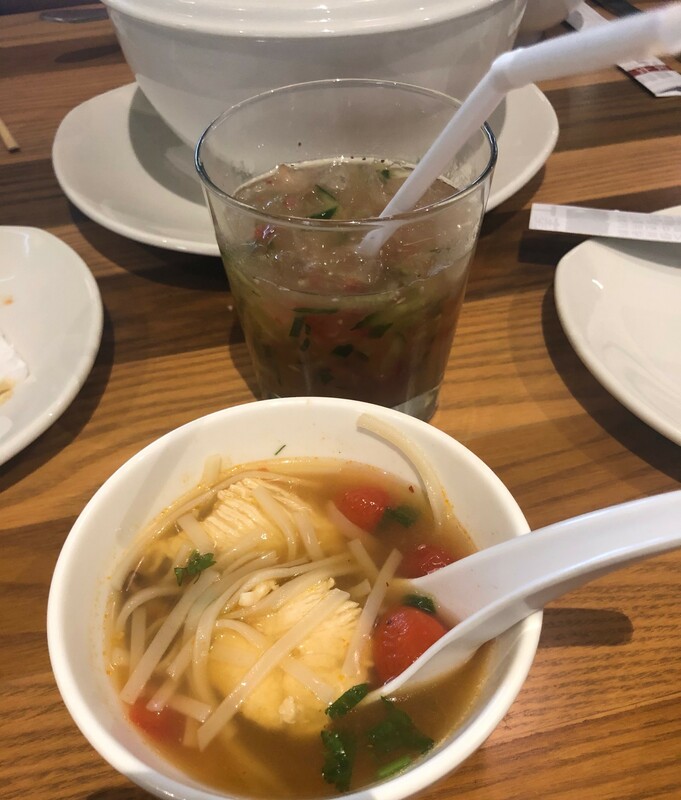 The soup was delicious and fulfilling and exactly like the one I have been having in Dubai for years now. A mishap occurred when the soup was spilled by one of my companions. The staff was super nice and friendly about it and offered us a replacement. The Shrimp although nearly as good as the one in Dubai, did not have the same quality of shrimp. The quantity was less than what I was expecting which resulted in me ordering two more servings for us. In some PF Chang’s in other places in the world they offer larger servings. What seemed a bit weird to me was that the next two servings were larger in quantity than the first one and had the exact same taste and quality as the Dubai ones. 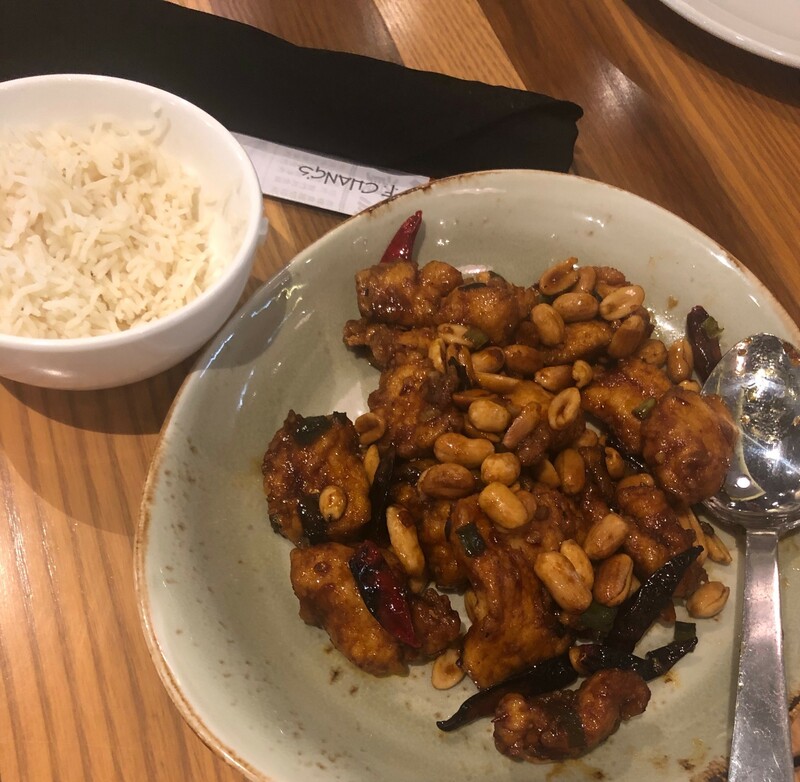 For my main course, I ordered the Kung Pao Chicken with white rice which again was excellent apart from the quality of the meat which in my opinion was the only downside. 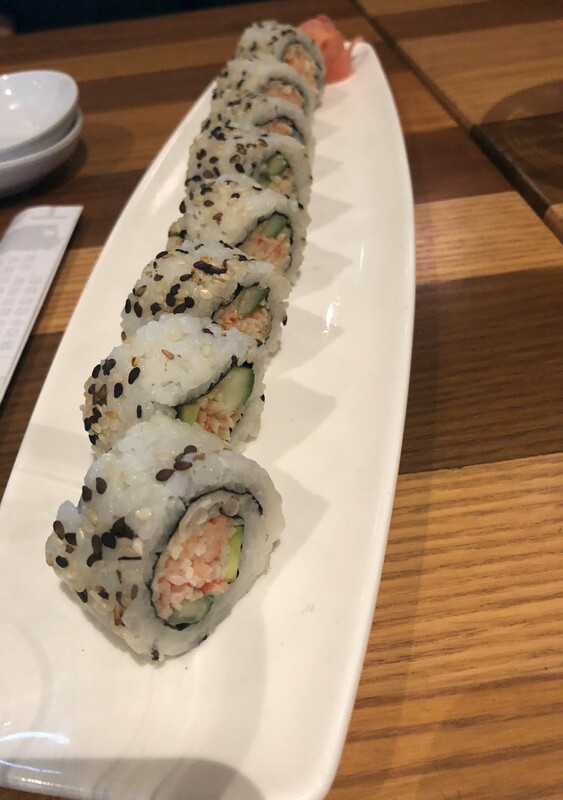 I also ordered 8 pieces of California Rolls as a sushi main course which I have no complaints against. The taste was great and the fish was of amazing quality. For dessert, I ordered something I had never had before: The Great Wall of Chocolate or in another word ‘heaven’. 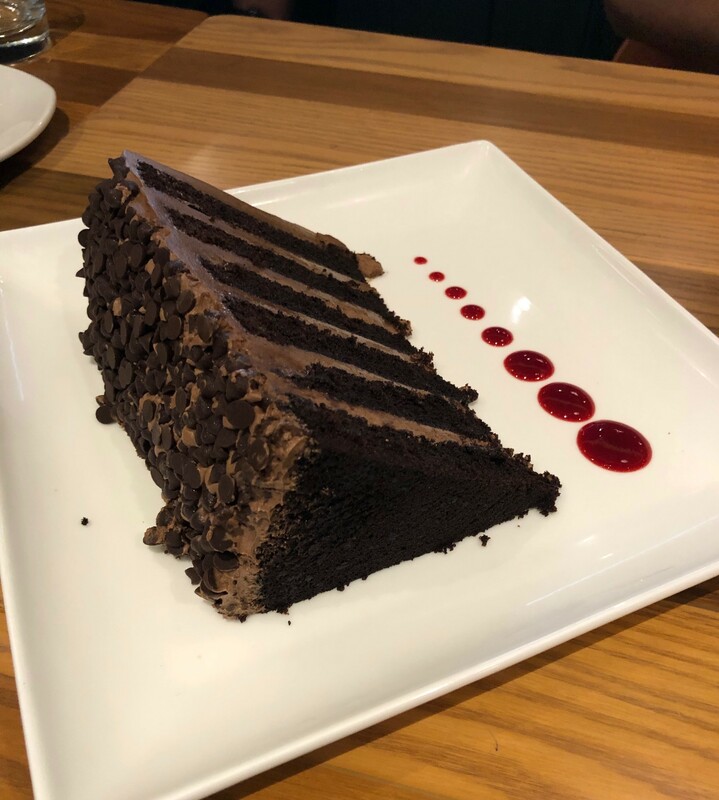 Six rich layers of frosted chocolate cake with semi-sweet chocolate chips is just what everyone needs in life. Overall the food was great, the atmosphere, the décor, the staff everything is up to standard. But on a side note, there was a certain hygiene issue involving one of the drinking glasses smelling of egg and one of my knives being dirty. On a scale of 1-5, I give it a 4 star rating. Mascara is a must-have makeup product for women. Mascara always gives a glamorous look to the eyes. It opens them up, makes them look bigger and dramatic. Eye makeup is not even complete without a mascara. It is used to add volume, shine and colour to your lashes. There are so many famous brands providing mascaras. Here is the list of Top 5 best mascaras in Pakistan. 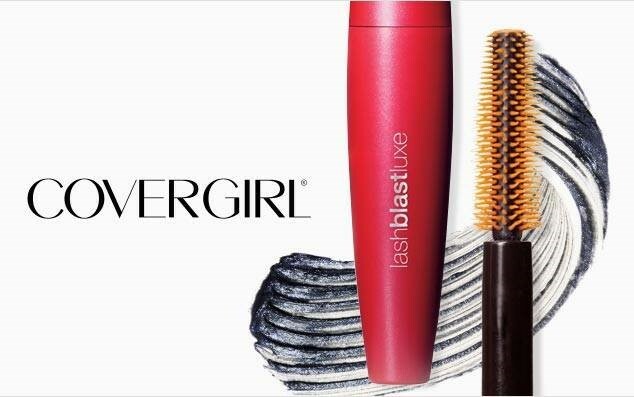 Cover Girl lashblast luxe mascara gives your eye lashes a cluster look. Its glossy effect gives your lashes a shimmery effect. Long Lasting For 12 Hours. Original Lashblast Luxe Is Better than this product. Revlon Grow Luscious Mascara is famous due to its fine and thin texture. It is light-weighted and gives an incredible look to eye lashes. Gives Instant Longer and Lusher Look. Maybelline Le Colossal Volum’ Express Mascara gives a polished look to your lashes. This mascara makes your eyes look covered and fluttery. It’s thick and dramatic look make the eyes fuller. L’Oreal Volume Million Lashes mascara is the most popular L’Oreal product. This mascara gives your lashes a more dramatic look. It is very safe for eyes and will not give any side effects to your lashes. Diorshow New Look Mascara is the most demanding mascara in Pakistan. It always crafts the eye lashes to look attractive and glamorous. It makes the lashes fuller and thick. Gives Volume to Every Single Lash. Oats help moisturize and exfoliate face naturally. It is a great ingredient for facial scrubs and packs to reduce a host of skin problems. Oats not only have nutritional value but also offer skincare benefits. They possess antioxidants and anti-inflammatory properties which is why they help exfoliate, cleanse and moisturize the skin well. Oats contain vitamin E and polysaccharides which soothe the skin and form a soft layer that protects it. This helps keep the skin soft and supple. Oats, when used with milk and honey, seep in the right amount of moisture and clear out dead skin cells, as well. 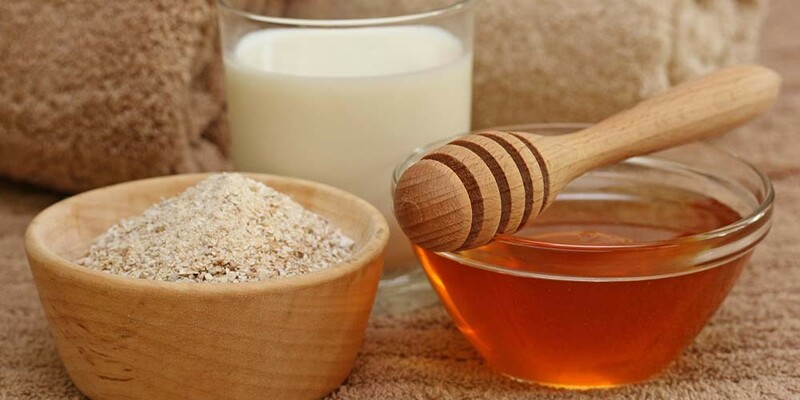 You will need two tablespoons each of oats and raw milk, with a tablespoon of honey. Ensure the oats used are finely powdered. Blend all the three ingredients well and apply all over the face and neck, leaving the eyes and lips. Wash it off once dry, or you could mix some crushed oats powder with warm water and apply in areas with itchy skin. After 15-10 minutes, wash this off well with water. Oats work on evening out skin tone along with lemon juice and milk which possesses skin lightning effects. It scrubs out all the impurities and dead skin cells from the skin’s surface. Lemons are natural astringents and bleaching agents which makes them effective in lightening your skin tone while milk controls pigmentation due to the lactic acid present in it, hence giving a clear complexion. Boil two tablespoons of oats and let it cool. Then, mix it with two tablespoons of milk and four tablespoons of lemon juice. Blend these well and apply all over the affected area. Leave the paste on for at least 20-25 minutes then wash off with lukewarm water. Oats make for a great moisturizing face pack with naturally beneficial ingredients, like rosewater and honey. Rosewater is used as a natural astringent along with honey which keeps the skin well-hydrated and fresh. Take two tablespoons each of oats and a tablespoon of honey and rosewater, each, and mix well. Apply this all over your face and neck, and leave it for not more than 10 minutes. Wash off with lukewarm water. Cooked oats are an easy and natural remedy to relieve the skin from acne. It also cleanses clogged pores efficiently. The anti-inflammatory, anti-microbial properties and antioxidants in oats act as an ideal acne cleanser. Cook some oats and leave to cool till it can be applied on your face. Leave it on for 15-20 minutes after application and rinse once dry. 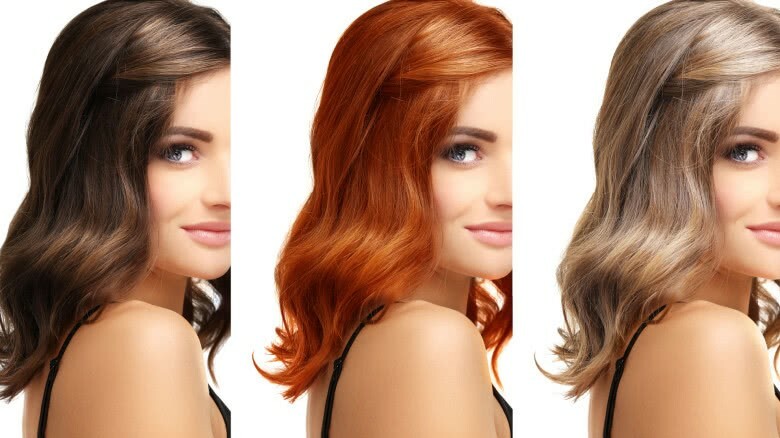 We often see hair colour disasters on women where the streaks or the full colour of the dyed hair looks very unflattering with a certain complexion. 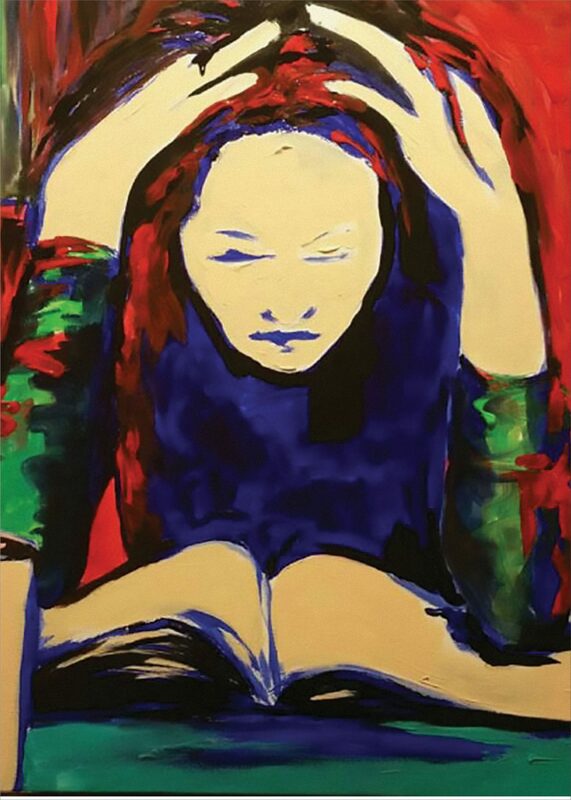 We do believe that every woman is free to choose and go as wild as she wants in her choice of hair colour but isn’t the ultimate goal to improve upon the looks? For this you need to determine your skin tone and then pick a shade that will work best for you. – Wash and cleanse your face thoroughly to get all makeup off. – Find a well lit place which has a large window with plenty of natural light flowing in. – Do a colour test by holding a blue shirt against your skin and then a red one. If your face looks better in blue you have a cool tone, if it looks better in red you have a warm skin tone. If you are unsure get two of your friends to take a poll on what suits you better. If you have determined that you have a warm skin tone, you will need to choose a colour in a cool tone. Yes it may be surprising but this will compliment your skin. The cool colour shades have words such as ‘cool’ and ‘ash’ in them. They have a definite platinum silvery tone. But if you like more traditional and closer to your south-Asian hair colour tone, go for a darker colour. Think fawn, really dark brownish-black, dark red, chestnut, amber or auburn. If you want to go for highlights, then go for a cooler colour to make sure it doesn’t look brassy against your face. If you have a dark complexion, but you have figured out that it is a warm tone, then go for a shade which is definitely lighter than your complexion or much darker. It is very important to make sure that your hair doesn’t look almost the same as your skin colour because that will be a disaster! Your biggest priority should be that you don’t want to look washed out. Choose a warm colour to make you look alive. This is true for dark or fair skins both. If you are a cool tone, then you must figure out how to balance it out. Look for shades that contain words in them such as ‘warm’ or ‘honey’. Think of a rich chocolaty shade. If your heart desires blondeness and yet you know you have a cool skin tone, then go for blonde by avoiding the blonde shades which have too much silvery platinum in them. If you are a woman who likes to be funky and wants to experiment with fun colours you can do it not with blue but with pink. Just remember the trick is not to go for a cool shade and opt for a warmer one. Whether you have a cool or a warm skin tone, also keep your complexion in mind. Fairer skin can carry lighter colours well. If you have a darker complexion, a blonde colour even if you pick the right blonde shade according to you skin tone, might not look flattering. The darker you are, the more rich and dark shades are the ones you can carry and will compliment you. Images: Shuuterstock. Acne has a tendency to show up at the worst time. Find out all you should know about its treatment in easy ways. When you are not exfoliating and scrubbing off dead skin this happens- they pile up on the skin’s surface and block pores, which leads to a buildup of oil and hence the whiteheads. Do you have reddish pimples? These breakouts are caused by hormonal imbalance when you are stressed and you have excessive oil. They can also be linked to your menstrual cycle. Mild, non-hormonal breakouts can easily be managed. Apply a treatment with two percent salicylic acid, which exfoliates. You can also switch to a daily cleanser with at least 0.5 percent salicylic acid. If your zits last more than eight weeks, consult with a dermatologist. Scarring can be avoided if you treat acne early. In addition to starting you on a benzoyl peroxide cleanser regimen, you may be given a combination of other treatments. Ask your doctor to ensure that it does not make you more sun-sensitive or dries your skin. If skin is irritated stop immediately. Dermatologists may offer high-tech remedies such as the ones which use suction to deep-cleanse pores. A light pulse is used to kill the bacteria that causes acne and redness. You can find out about them at your local dermatologist or skin treatment clinics. If your acne is the hormonal type no product that you apply on the skin will make any difference. Many women are given birth-control pills that can help clear up skin. Estrogen and progestin help suppress testosterone and prevent breakouts. If you love pizza with extra cheese, then you are not going to like this! Studies prove that cutting back on dairy can improve acne. It includes all milk products as well as sugary delights! Trying to burst your pimple is a major skin crime. It can spread bacteria, cause additional breakouts and lead to scarring. But if you absolutely must then here’s how to cope: Dab the area with any good sterile solution to disinfect it, then apply an antibiotic cream or ointment which will fight bacteria and help the spot heal. If you have acne, chances are pretty good that you also tend to get blackheads. They are caused by oil and debris that has darkened within clogged pores. Start exfoliating with two percent or less salicylic acid or glycolic and lactic acids every morning. Let it sit for about a minute on damp skin in order to give the acid time to do its thing, then rinse. Don’t use your fingers to get a blackhead out. After you shower, hold a cotton swab on either side of the blackhead, then gently press down. Don’t force anything… if it doesn’t budge, abort mission and apply a benzoyl peroxide spot treatment. When all efforts fail and you have a pimple learn how to cover it like a pro. Press it with a cotton swab soaked in witch hazel (or any sterile solution), then with another swab soaked in eye drops as they contain anti-inflammatory agents which reduce redness. Dab a medicated concealer on it. If a pimple is huge, it will cast a shadow, so try a different method: Brush on a mattifying primer, before applying foundation. Then pat on an opaque, full-coverage concealer. Acne scars can be covered with an eyeliner brush. Run the brush over a stick concealer and coat the inside of the scar. This hides the shadows that make these scars appear more recessed. Then apply a mattifying liquid foundation. And just like that you get full coverage and you are good to go to that party with confidence! Exfoliation is key to prepping your skin for cosmetic application – the smoother the surface, the more even products can be applied and therefore, the longer they last. Twice a week polish away dead surface cells with a good exfoliator. Invest in a good, trust-worthy exfoliator to be a part of your routine. Ever noticed that your make-up starts to collect into fine lines and creases come mid-morning? Hydration levels and sebum production fluctuate through the day causing your skin to look more uneven, but there are moisturizers that respond to ‘over-day ageing’ to aid this. Use one that makes your skin smooth and firm while you wear it. Primer seals in your moisturizer and provides a smooth, even surface for make-up. Not only this, it keeps your make-up from being absorbed, giving it greater staying power. If you have oily skin and feel like your make-up slips off, try an oil-free formula for an all-day matte finish, however, if you feel your make-up fails to wear well because you’re battling dry patches, try something that seals in moisture for hours. Using a different primer for delicate eyelids intensifies your make-up, ensuring it doesn’t crease, slip or shift. Long-wear make-up is called this for a reason; good one boasts budge-free formulas without looking heavy. A reliable product will cover everything from gel eyeliner to mascara and is great for dry and dehydrated skin. One which contains shine absorbers is perfect for oily skin types, as well. The secret for long-lasting lipstick is sandwiching in the color. First, frame your lips with a lip liner, mapping out your cupid bow and the corners, which will give structure and grip for your lipstick. Then apply your lip color with a brush, building it in fine layers and finish with another coat of pencil to set it. While it’s tempting to top-up your make-up throughout the day, go easy, as too much powder can look cakey and leave a heavy finish. Build-up can also increase your pore size and surface dehydration in the long run, so focus on preventing that. We’re all guilty of touching our faces without realizing that we are spreading germs, viruses and allergens around – and while we’re at it, we’re ruining our make-up, as well. You can spend gold on high performance products but if you’re habitually picking your spots and rubbing your eyes, you might as well not bother. Consciously find another activity to replace it with, like interlocking your hands or clenching your fist. The health benefits of coconut water are plenty! Safe, healthy and natural; this natural drink has very little sugar and is full of antioxidants that will boost the supply of electrolytes in your body and keep you hydrated. This wonder drink has many benefits for skin and hair, too. Coconut water helps in controlling the signs of ageing. It contains lauric acid and cytokines which help in balancing the growth of cells and their regulation. The consistency of this drink and properties, such as Vitamin C and potassium, help in providing coverage and protection to the body. Coconut water can be applied all over the skin and air dried for a few minutes. Doing this daily would show great results. Mix fullers earth or multani mitti with a few drops of coconut water, apply on the face at least three times a week to see quick changes. It will leave the skin soft, radiant and smooth. This face pack is completely natural and doesn’t contain any chemicals, or leave you with side effects. The antioxidant-rich coconut water can help fight free radicals and prevent acne. You could also wet some cotton with coconut water and dab all over the areas that have been affected. Let it stay overnight. Wash off with cold water the next morning. Coconut water is not just idyllic for your skin but also your hair. Massage your hair using coconut water thrice a week, and it will make your hair soft, smooth and silky, as it contains excellent moisturizing properties which fight with unruly hair the natural way and promote strength, radiance and shine. Coconut water can also help in fighting dark circles. Simply mix coconut water with cucumber juice and dab it around eyes using cotton. Use this beauty tip daily to see a quick reduction in your under eye dark circles. Another wonderful thing about coconut water is its ability to condition locks of hair. Mix cocoa butter and coconut water together, and let it stay overnight. Apply it all over your hair and scalp after shampooing and wash it off with cold water after 20 minutes, you are bound to see good results. As we all know new year’s is around the corner and the winters are at their peak. What suffer most during this time of the year is our skin and hair; which tend to dry out, becoming dull and lifeless. What you need is deep nourishment, something that will hydrate your skin and help it retain its moisture from within, safe from the ravages of the winter dry air. Winter face packs are here to rescue you, and no, you won’t have to visit a salon every week, either because there is nothing easier and better for your skin than homemade recipes. With a few everyday ingredients from your kitchen, you can rustle up amazing packs for glowing and moisturized skin. Even though all these recipes use natural ingredients, do a small patch test before you apply anything on your face. Banana is not only a delicious fruit but has excellent nutritious power to take care of your skin. It can work splendidly as a moisturizer in winters. Mix a spoon of mashed banana with milk powder (you can replace milk powder with rose water if you have oily skin) and add a few drops of honey. Leave the mask on for 20 minutes before rinsing off. Use this face packs twice-a-week and show-off envious skin throughout the season. Once you start using this, it will become your favorite pack, as it is apt for every season to keep your skin super hydrated and glowing. Grated carrots have little fiber that, when smoothly rubbed on to the skin, helps new skin to surface, peeling off the old while keeping the skin supple and soft. Mix together two tablespoons of carrot juice and a teaspoon of honey and apply this mask on the face, smoothly rubbing for 15 minutes. Let it dry for 10 minutes and rinse.